With five minutes’ work – if it could really be called that – you can prep this delicious roast chicken and sleep the sleep of champions knowing that tomorrow night’s dinner is, quite literally, in the bag. The marinade couldn’t be simpler. At its heart, harissa paste, full of fire in its uncooked form but deep, complex and mellow after cooking. If I’m not using my own version of harissa, I go with one of my favourites in a jar from local food stars Christine Manfield or Peter Watson. Use your favourite or explore your local makers to find a winner. Greek yoghurt, creamy and tangy, and a little lemon juice and salt round out the marinade. 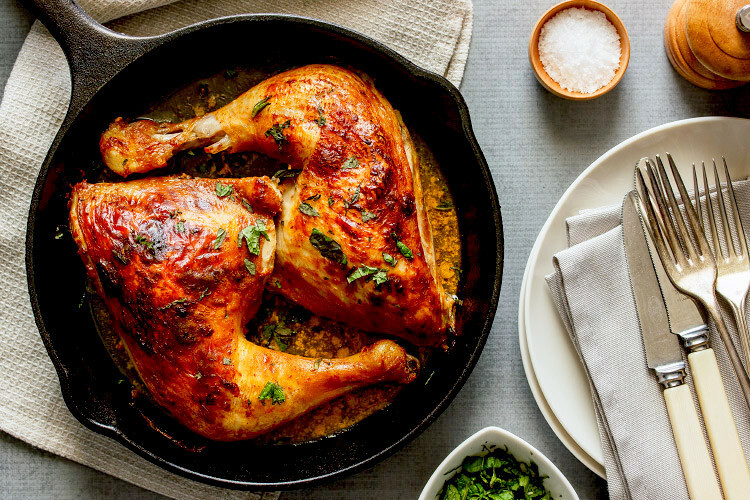 The yoghurt will give you unbelievably tender chicken, as will the lemon juice, which also really helps to get the flavour into the meat in a way that you’ll agree makes the wait worthwhile. As a bonus, you don’t need to add any extra oil: the marinade will protect the skin and the fat renders out of the chicken as it cooks. My culinary weapons of choice are equally simple: a ziplock plastic bag to accomodate the marinading, and my cast iron skillet, repurposed as a roasting tin, because it holds two chicken Marylands snuggly. You may prefer to marinate in any non-reactive bowl and to roast in the tin of your choice to deal with the numbers you are feeding. I tend to head in one of two directions for an accompaniment depending on my mood. Sometimes, I play off the harissa’s spiciness with my spiced baby eggplants; at other times, I park the chicken on a cloud of my proper, old-fashioned, serious mash. Either way, I always serve it with a smattering of chopped mint, which brightens the chicken up and adds the perfect note of lively freshness. To make the marinade, stir together the yoghurt, harissa paste, lemon juice and salt in a small bowl until well combined. Put the chicken pieces in a ziplock bag (or non-reactive bowl) and pour over the marinade. Make sure the chicken is well covered and refrigerate overnight. To cook, set your oven to 200°C (400°F). Remove the chicken from the marinade, shaking off any excess but not too thoroughly you want a little left on the chicken and then you won’t have to add any oil. Transfer to the roasting tin of your choice and roast for 45 minutes, basting at the halfway point, until glowingly golden brown and cooked through. Sprinkle with chopped fresh mint to serve.